I guess some things are just always moments you want to capture, like your daughter watching a Magic Kingdom parade. We've done it again, but these two shots were not planned. I was looking through some of Dad's old photos and realized the one of me looked familiar. Update: A few readers have expressed an interest in the 1979 Magic Kingdom parade. Follow the link to see Mickey, Minnie and Donald by the firehouse. Gotta have Mouse Ears. I have sent more of those around the world to friends who have requested them than any other Disney souvenir. Love the Mickey ear hat tradition! Beautiful shots!! 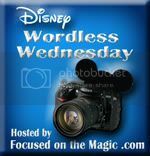 Thanks for linking up today and sharing your Wordless Wednesday with The Disney Wordless Wednesday Blog Hop. Such special photos! I hope one day that my daughters will be able to compare pics of their little ones with the photos that I have taken of them on our trips to Disney. Oh, what great pictures! 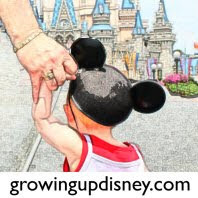 So neat that you have something to show how multiple generations have loved the magic! I wonder what the parade was in 1979. Surely somebody here must have that bit of useless information stored away in their brains. Love the concentration on the parade. Who cares if Mom or Dad are taking pictures behind me. Awwww, you got me again! Another tear jerker; you know how I love your family history! !